Bill Utermohlen (1933-2007), an American painter living in London, had the misfortune to come of age as a figurative artist in an era when conceptual and abstract art ruled the day. But in 1995, Utermohlen was diagnosed with Alzheimer's. The diagnosis would change his life - and transform his art. 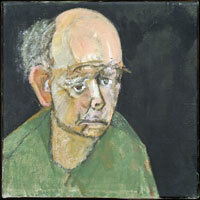 Almost immediately, he began a series of paintings called "The Conversation Pieces." 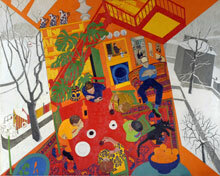 The brightly colored works, reminiscent of Matisse, are set at home, featuring his wife, friends and colleagues in conversation. Notably absent - or present, but distant from the other figures - is Utermohlen himself, already isolated by his disease. GLASSY-EYED features extensive interviews with the painter's wife, art historian Patricia Utermohlen, and innovative, playful sequences capturing the process of artistic creation. Utermohlen's final body of work is of interest both for its artistic merit and also for the deep insights it offers into the experience of Alzheimer's. The self-portraits represent a "veritable clinical journal" like no other. This three-part series addresses common but often misunderstood behaviors of patients with Alzheimer's and other forms of dementia. Explores the artist's work and philosophy, using extensive interviews and documentation of artwork installed around the world.